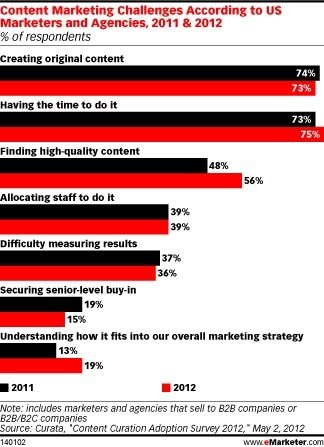 Some surveys (see infograph at left) show that most marketers don’t think they have enough time to create original content and have trouble coming up with original ideas worth writing about. However, Cohen writes, the real challenge is that the marketers are not allocating enough human and financial resources to make it happen. Maintain a list of content marketing topics and suggestions. To guarantee your organization always has sufficient subjects to cover, invite all of your employees, regardless of title or position, to submit their ideas. […] Also use social media to gather insights for new posts through customer comments. Develop a structure for various types of content. Combine this with an editorial calendar or other form of scheduling system for your content to give content creators a jump on composing your content. […] Make sure that you have sufficient content to share on the social media platforms where your organization is active. Let your passion shine through. Human feelings and an authentic voice are critical to social media and content marketing. To this end, it’s important to avoid corporate speak. Mashable‘s Ted Rubin also mentions the importance of being authentic in all your engagement with your audience. The only way to be authentic, he writes in his article, “How to Create Real Relationships With Social Marketing,” is, well, to be authentic. True authenticity — not just using that word often in your tweets and posts — will set your brand (product or personal) apart in today’s highly competitive market. Followers and advocates can and will sniff out a fake in a heartbeat. One of the way to be authentic, he writes, is to let it all spill out, your brand’s negative feedback and all. Don’t hide your negative feedback, he says, make it public and address it honestly. Advocates are an incredible asset now more than ever. Treat them as such. But perhaps the best piece of advice in Rubin’s article is: Be an actual friend. Take the time to connect via Facebook, Twitter or LinkedIn after meeting someone in person at an event, follow up, save this person’s contact info; make a note on the circumstances of the the meeting, or any detail or tidbit that will help you remember that person. Forget the adage Win/Win and make a commitment to Learn/Learn. Win/Win is good, but implies an end. Once you win, then what? Learn/Learn creates a paradigm of ongoing value. This creates a Learn/Learn situation. I learn about you and you learn about me. And we learn from each other. There are many ways to engage with your audience these days, of course, the Internet is awash with ideas, advice, and lists on the topic, some covering pretty obscure niches. Pam Moore lists 25 content marketing ideas in her recent article on Business 2 Community that targets “people who don’t like to write.” Basically, she supports the idea of less is more, when content creation and distribution calls for it, and lists the appropriate channels. News: This is one of the easiest to find content sources. The trick is to add your own opinion, interpretation and thoughts on how it impacts your industry or niche. Tips and How To Lists: People love to read content in easily consumable and sharable bits and bytes. Your lessons learned. Even if you have only been in business 30 days longer than some of your readers, they can learn from you. Share your best tips. Write brand stories. Share stories of your experiences in business and life. […] If you can learn to share stories that guide people through a scenario they can picture in their head, relate to, they will often times become loyal followers and friends. Expert interviews. Interview industry experts, thought leaders and influencers your audience would like to hear from. Keep it simple and ask them a few questions. Guest blogging. Invite some of your favorite bloggers or industry thought leaders to guest blog on your blog. Write a series of blog posts. I am a big believer in creating an editorial calendar that is dynamic. […] I love creating what I call ‘content buckets’ of which I include specific topics and sub-topics into one series. People love them. There you have it. Fairly obvious stuff that may or may not be hard to implement: Be real, listen to your audience, don’t waste their time, treat your friends and advocates well, keep your offerings simple yet unique, and, if you can’t write, either outsource or keep it on the level you can handle. 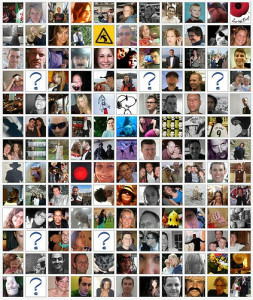 Image of the Facebook friends grid by Dan Taylor, used under its Creative Commons license. Infograph by Curata, used under Fair Use: Reporting.